The Minneapolis Park and Recreation Board offers many options for parking throughout the parks system. Pay parking areas are in regional park lots, on-street meters on parkways, contract lots, and event parking. There are many free parking lots (including neighborhood parks) and bays on parkways throughout Minneapolis. The links below provide information on specific areas of our parking services to meet all of our park patrons needs. For areas of parking, how to use our pay parking terminals, and ADA accessibility policies, please see below on this page. Pay Parking is enforced in pay lots and on-street meters daily, including holidays. Please note that Minneapolis Park and Recreation board pay parking regulations may differ from other municipal entities for holidays and hours of pay parking. Permit provides year-round parking privileges at all designated regional Patron Parking lots. During park hours, visitors with either handicap plates or placard (hang tag) are encouraged to park in the designated handicap parking stalls. If these spaces are unavailable, you may park in any space at no charge. Annual Patron Parking Permits may be purchased, but are not required. During park hours, visitors with either handicap plates or placard (hang tag) may park at any parking lot meter or on-street meter at no charge. The parking kiosk would not accept my payment, what should I do? Please report a meter issue using the online form on this page. I received a citation, what are my options? See the Tickets & Citations page for more information. Does my Annual Patron Parking Permit apply to parking kiosks? The Annual Patron Permit is not valid at on-street multi-space or single space parking kiosks. Can I purchase my parking in advance? At this time we do not offer advanced payment of parking for our on-street parking kiosks or in pay lots, with the exception of reserved parking for private events. Do I have to pay for parking if I reserved an event space? Parking for private events that require the use of a pay lot is arranged when you make your event reservation through Use and Event Permitting. Do the parking kiosks accept credit cards? All multi-space on-street parking kiosks accept coin or credit card(Visa, Master Card, American Express); single space parking kiosks on West River Road and East River Road only accept coins. When is it required to display my receipt on the dashboard? Pay and Display Parking Lots require receipts to be displayed face up on the dashboard. On-street multi-space parking kiosks do not require receipt to be displayed, but we recommend holding onto the receipt for your records. Single space parking kiosks (coin) do not print out receipts. East River Flats: $1.75 per hour, $7.50 per day. After 3pm $4.00 per day. Bohemian Flats: $1.00/hr, $2.25/day before 10am M-F, $4.00/day Mon.-Fri. after 10 am and all day Sat.-Sun. Minnehaha Park (North of 50th/MN Veterans Home): $1.50/hr, except Fri-Sun from April-Sept is $2.00 per hour. Meters accept U.S. Quarters and Dollar coins, along with Credit Cards (Visa/MasterCard/American Express). Select meters accept U.S. bills: Minnehaha Falls (2 meters), Nokomis Main (1 meter). No change or refunds given. Meters enforced daily, including holidays. Hours: Most lots are 6 am-10 pm, but there are some locations where the hours are 6 am-12 am. Please refer to “No Parking” signs in each pay lot that indicate the hours of no parking. Please note that parking hours and days may vary from other municipalities. 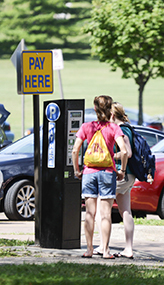 See the Annual Parking Permit page for information on where the parking permit is valid. The Trailhead – The Loppet foundation may validate parking fees for certain events. Receipt must be presented for validation. 2101 Cedar Lake Pkwy. – 21st St.
2501 Cedar Lake Pkwy. – 25th St.
5001 E Lake Nokomis Pkwy. 5201 S Minnehaha Dr. – 52nd St.
5235 S Minnehaha Dr. – 53rd St.
$2.00 per hour 4 pm-12 am Mon-Fri, all day Saturday-Sunday. Please note that 6 am-4 pm this area is closed to public parking as it is a loading zone. University of Minnesota Police Department enforce loading zone. Park Police enforce pay parking. Meters accept U.S. Quarters and Dollar coins, along with Credit Cards (Visa/MasterCard/American Express). Hours: All on street meters are available for parking from 6am-12am, daily. Parking is not permitted from 12am-6am. Please note that parking hours and days may vary from other municipalities. East River Road – U of M Fairview Hospital Frontage, west of Harvard St.
W River Road parking bays – N 4th Ave. to S 4th St.
B.F. Nelson Park Marshall Ave.
West River Road – North 4th Ave. West River Road – North 4th Ave.
Minnehaha Park – Longfellow Gardens 3965 East Minnehaha Pkwy. Minnehaha Park – Lock & Dam 4952 Godfrey Pkwy. Minnehaha Park – Wabun Picnic Area 4901 Godfrey Pkwy. Same fee if purchased at a later date. You cannot purchase a second permit to replace an expiring permit on a vehicle – renewing an expired permit is the same price as the first permit. Issued when you return original permit and replacement fee. Expires the same month as original purchase. Each permit is linked to a license plate number. Permit holders with incomplete or incorrect license plate information may receive a citation. Permit holders are responsible for providing and maintaining accurate license plate information. Permit valid only when affixed to inside lower right corner (passenger side) of windshield by its own adhesive.